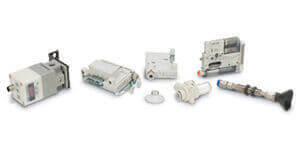 Vacuum regulator units, suction cups, vacuum buffers, vacuum sensor switches, fittings and vacuum instrumentation solutions allow the broadest utilization of technology and performance to meet your design specifications. Most options are modular allowing you to add only those that are relevant to your application. SMC suction cups are available in many different materials, sizes and shapes, and include options like stroke buffers to ensure that a perfect fit is made for each application. The diverse performance characteristics of SMC vacuum products allow utilization in a wide array of applications from manufacturing, packaging, assembly, to material handling. Precision combined with performance and a full line of accessories offers a comprehensive engineering solution to meet your specific need. 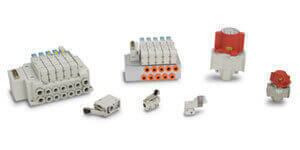 SMC vacuum products offer comprehensive options for vacuum applications. 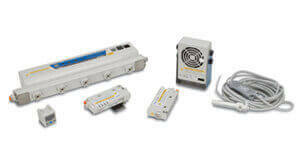 Compact, lightweight air vacuum generators are available in a wide range of sizes and performance ranges. Suction Cups are designed in a range of 19 diameters from 2mm to 200mm for use in delicate or heavy applications. SMC suction cups are available to fit many unusual shapes and are constructed from a variety of premium materials such as Silicon, NBR, Urethane, Fluorine etc. 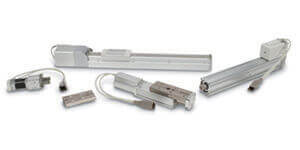 Installation options can be specified on either spring loaded buffers or threaded stems. Special application cups are also available such as check valve, porous material, annulus area etc. Vacuum Generators use compressed air to generate vacuum using a venturi. Vacuum levels down to -27 inHG (-91kPa) is obtained from multi stage units with suction flow greater than 7 SCFM (200 l/min.) SMC's air vacuum generators can be connected via a manifold or used individually. These compact devices can also be customized to integrate suction filters, vacuum sensor switches, and supply/release valves onto the generator. 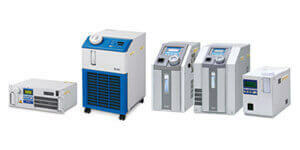 Additionally, SMC's generators can be configured to manage distribution of vacuum from a external vacuum source. Vacuum Filters that prevent trouble in vacuum equipment caused by contaminants in the air. They are light weight and compact. Filter elements are easily replaced without tools. 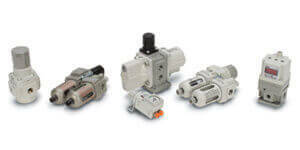 Vacuum Switches provide a completely integrated, digital solution designed to monitor vacuum status. 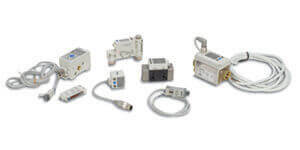 Vacuum sensor and switch outputs are integrated into ultra-compact, lightweight units. Easy push button calibration eliminates the need for tools. Available in either easy-to-read LCD with backlit or LED readouts which display current measured value as well as set points and output mode information. Vacuum sensor switch outputs are digital NPN or PNP and analog, with simple programming and multiple application features such as failure prediction and window comparator. 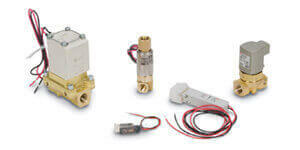 Vacuum sensor switches can be integrated directly onto many vacuum generators. Vacuum Regulator products offer a variety of options including compact and lightweight design, and front or rear mounting of the vacuum pressure gauge. 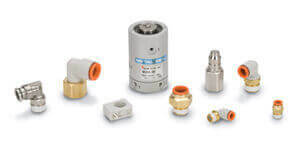 These vacuum regulators also offer standard panel mounting capability, adjustment resolution within 0.13kPa, and 1/8" to 1/2" threaded connection port sizes available. 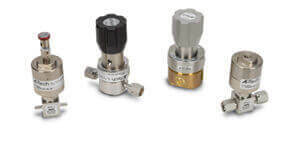 ZP2V is a vacuum saving valve that when multiple vacuum pads are operated by one vacuum generator, and some of them are not holding the work piece, the reduction of vacuum pressure is restricted and the work piece can remain held by the rest of pads. When the work pieces have different shapes, the control circuit can be simplified. There is no need for switching operation when changing work pieces. Vacuum away smoke, debris, and fine particles from the work area. Features both suction and blowing modes. Series SP adsorption plate was developed with an extremely flat surface to preserve the flatness of a workpiece surface, and adsorb without deforming. 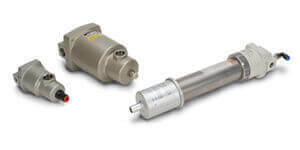 The ZCUK series is a non-rotating free mount cylinder for vacuum applications. The ZCUK was created by providing a vacuum passage in the rod of the CUK cylinder to enable a vacuum pad to be installed on the end of the rod. Series AMJ is effective for removing water droplets from the air sucked into vacuum pumps and ejectors. Series AMV exhaust cleaner separates and removes over 99.5% oil mist in compressed air and solid particles of more than 0.3µm. Vacuum chambers are generally used in the semiconductor manufacturing process. The peripheral equipment used to exhaust air from the supply atmospheric pressure to the vacuum chamber such as valves, pressure switches, cylinders and gate valves should meet conditions such as non-leakage, clean specifications and corrosion resistance. 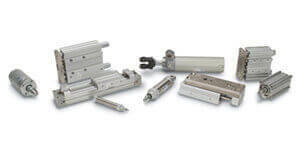 SMC's high vacuum products meet those demands.